But most of all, Na’ala loves to go on hikes and dip and splash in every single puddle or stream she can find. She’s a lab mix, and labs love water! And so, we aim to please her. And making her happy, makes us happy. Know what I mean? 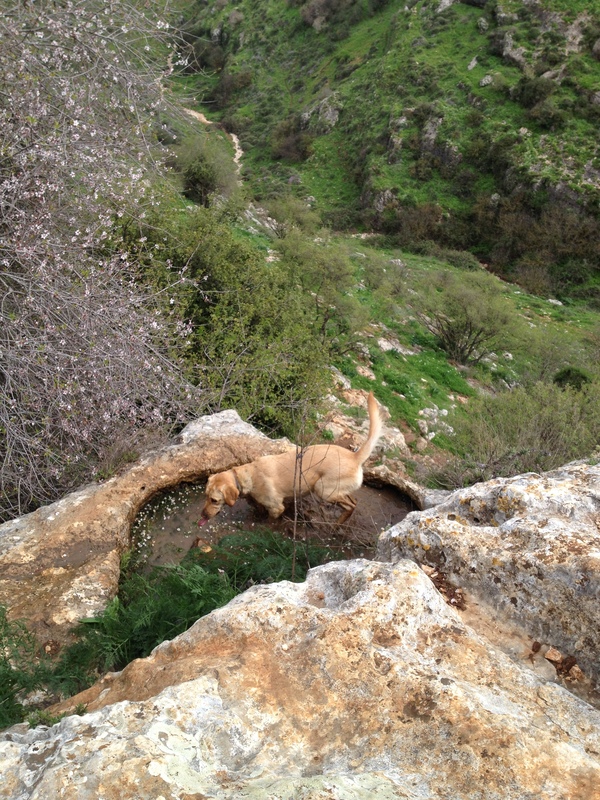 One of Na’ala’s favorite hikes lately has been to the Aviv Stream canyon, up north near the border of Lebanon. 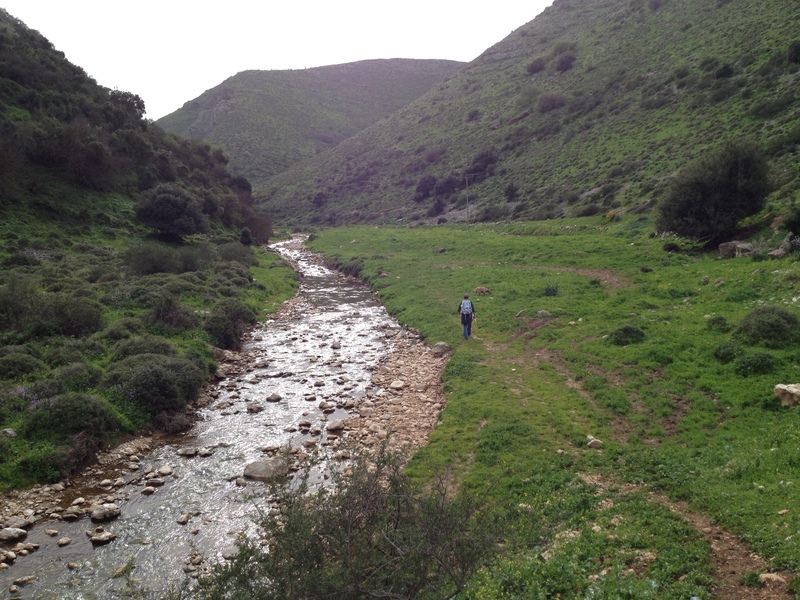 The Aviv Stream spills into the Dishon Stream and eventually drains into the Jordan River in the Hula Valley. 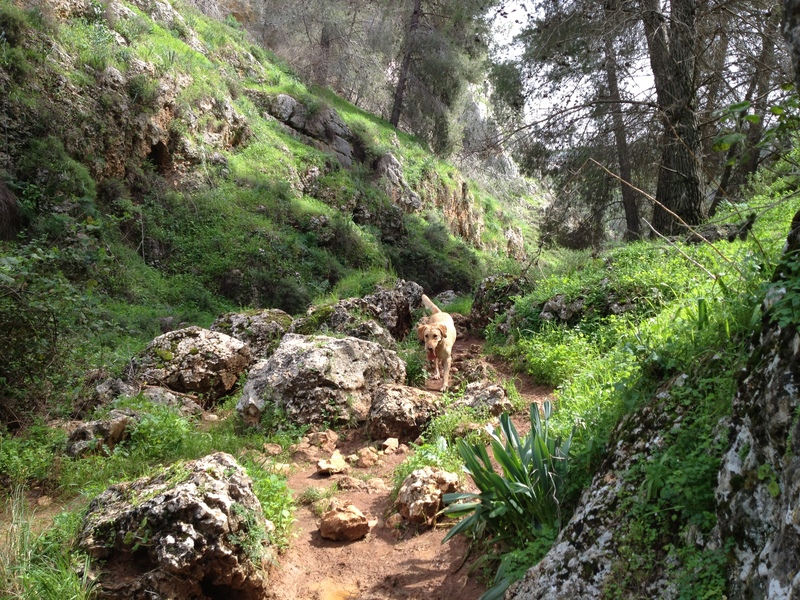 So today’s topic is a great hike in gorgeous northern Israel, one to be had with family, friends, lots of photos and of course, your dog. 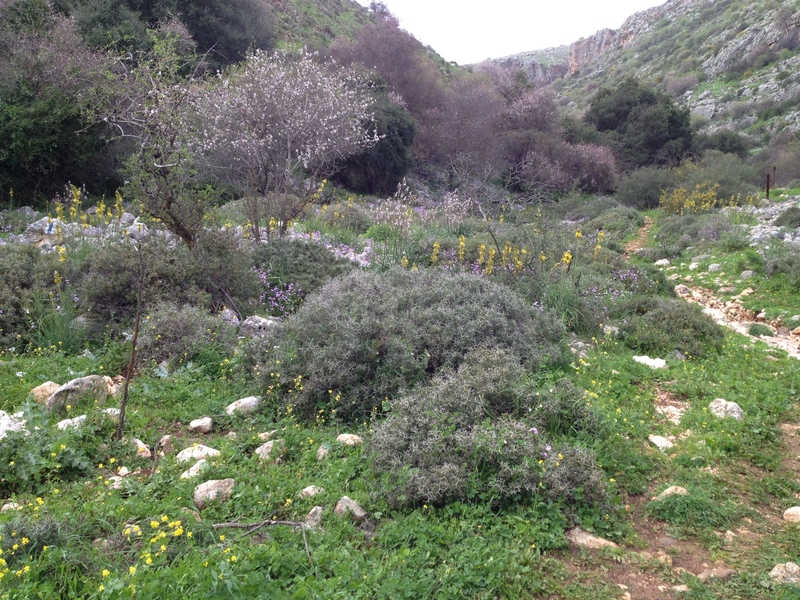 The start of the walk along Nahal (stream)Aviv is strikingly beautiful, as one walks along the dry river bed through a narrow canyon. As you may notice in my photographs, one of the reasons I mention our dear dog, Na’ala, is that she somehow managed to jump into most of my photographs that day, obviously wanting to be the center of attention. And so be it. 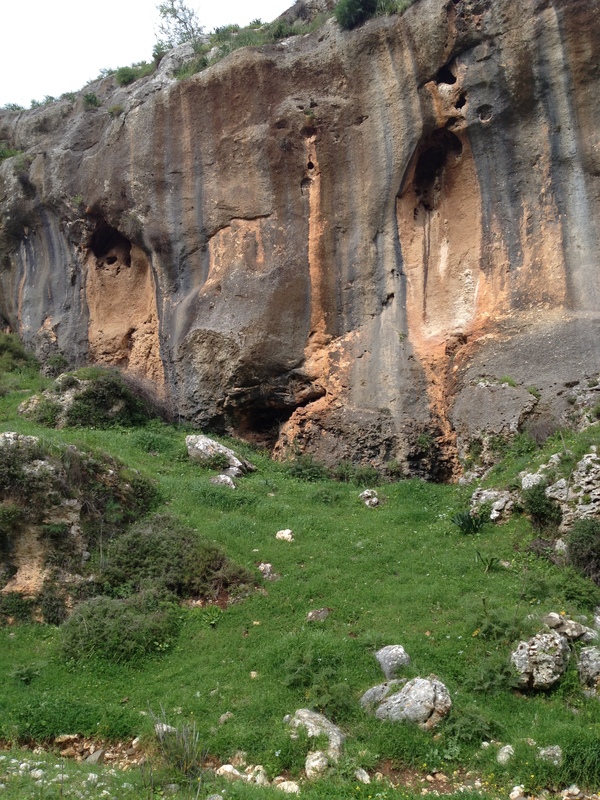 At the start of the hike along the Aviv canyon, one passes impressive karstic formations on either sides of the canyon walls. The karstic geological process, one by which rainwater dissolves and carves out the limestone, leaves interesting formations in the rock. 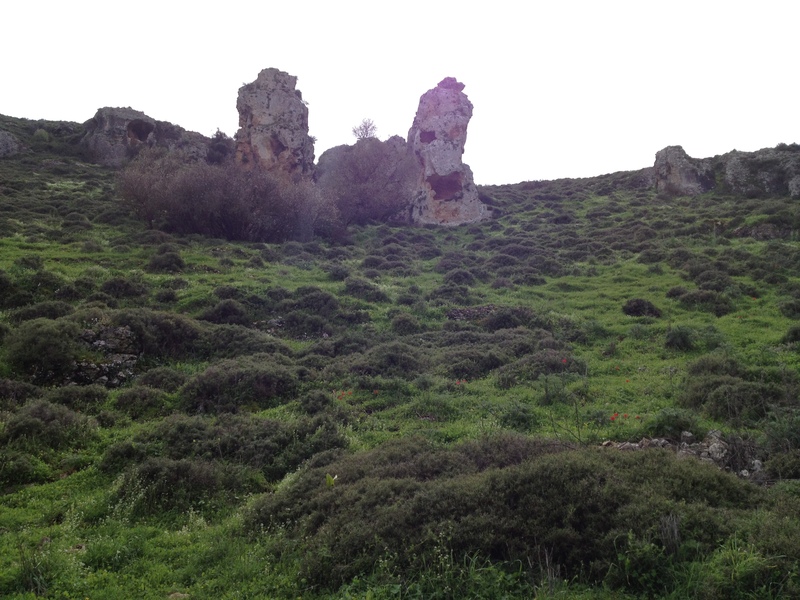 In this instance, the rock formations on the right seem to depict ‘maidens’ carved into the canyon walls. On the other side of the canyon, the hard limestone has been smoothed over and eroded by dripping rainwater, creating a striped, playful combination of colors on the walls. 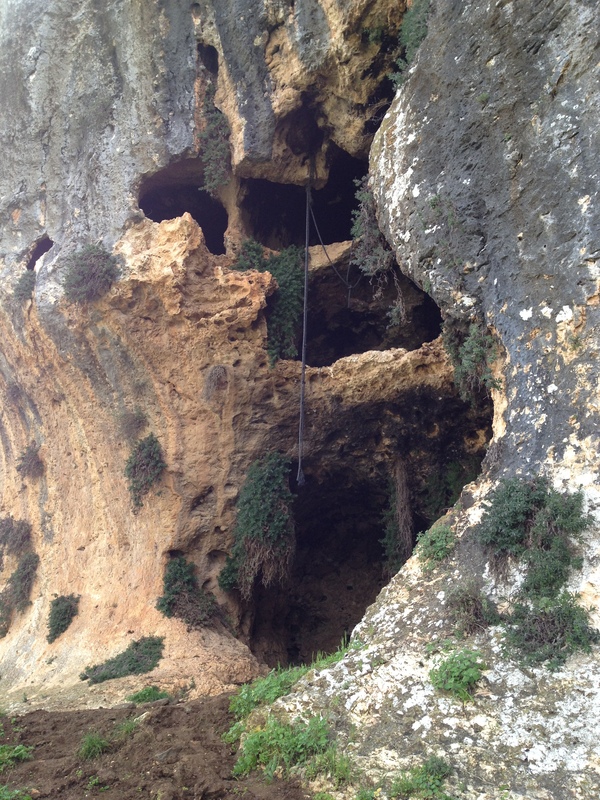 The karstic process also digs out and carves a variety of caves in the limestone rock. 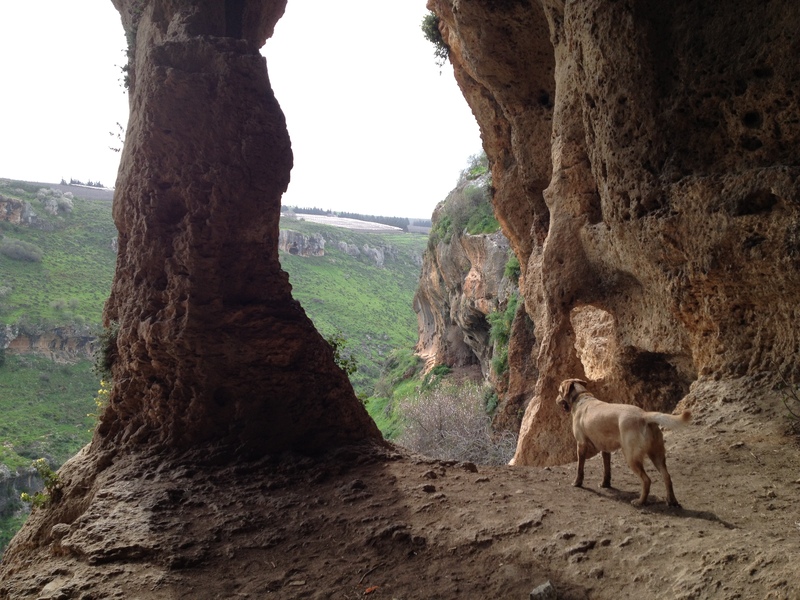 The Aviv canyon has impressive ones, some of which were inhabited in ancient times. 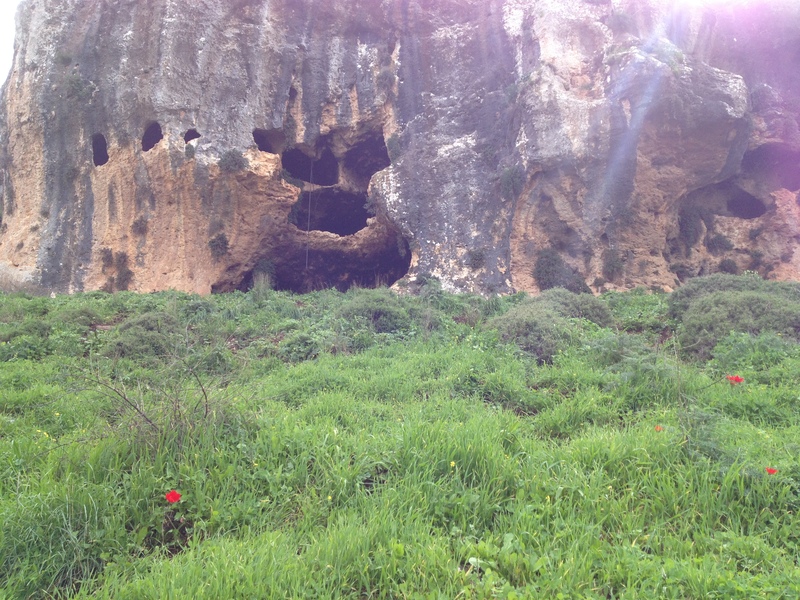 Along the hike we can find a Byzantine era burial cave, with 10 ancient tombs and a decorated entrance. 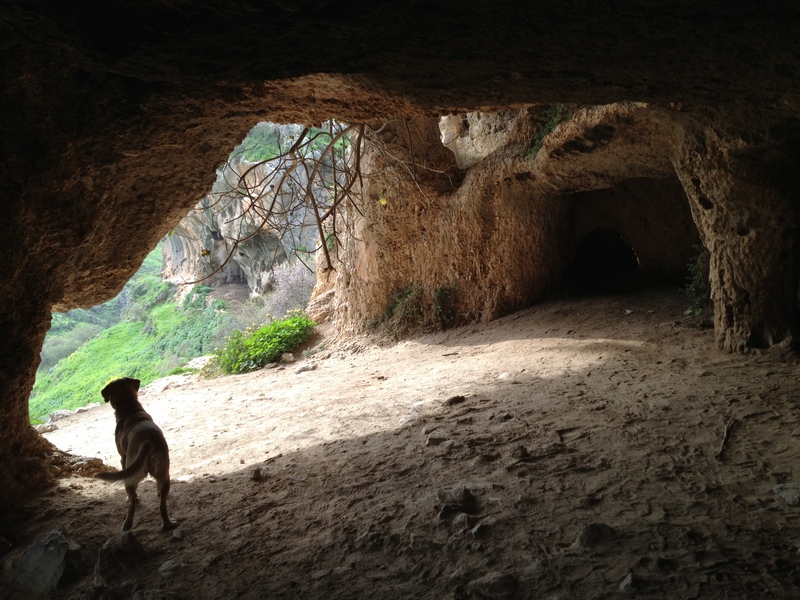 It is very possible this cave was used by the cave-dwellers who lived further down the canyon. Walking along the marked trail, we arrive beneath the Hanya cave, sitting about a kilometer after the start of the hike, high up on the cliff, accessible by quite a steep, challenging climb. One need not climb up, but to do so is exhilarating! This natural cave was carved by humans into a three-storied habitat, where the upper floor has a number of rooms and windows that look over the beautiful valley. Nahal Aviv eventually flows into Nahal Dishon, which drains into the larger Jordan River. The walk along the Dishon is leisurely and we ended the trek a couple of kilometers downriver by the parking lot. 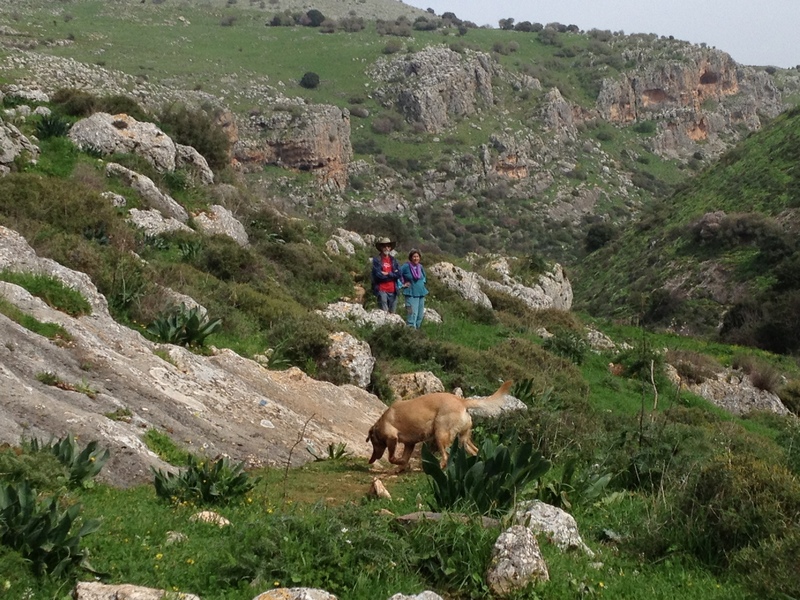 A big thank you to dear friends, Zvi and Linda, for suggesting this tiyul (trek, hike, trip) and accompanying us. 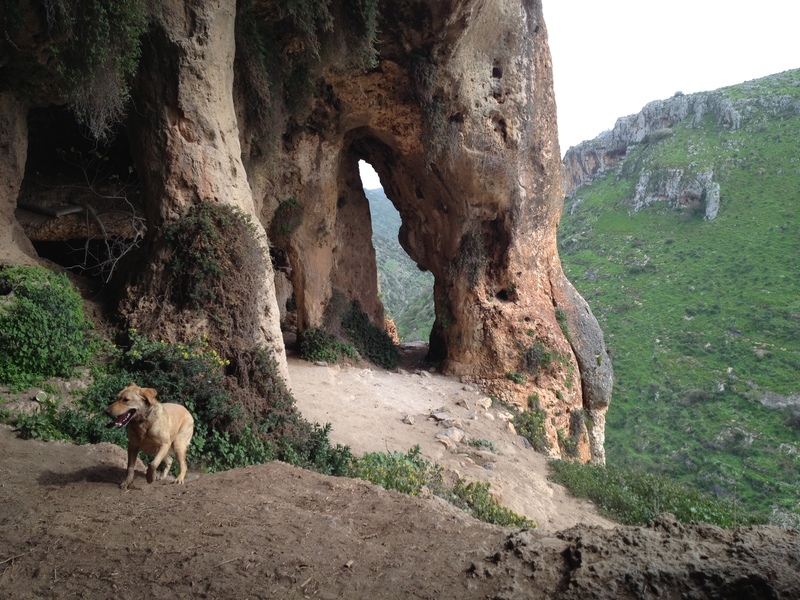 It is a very satisfying hike; a little history, a little geology, a little adventure, some cave exploration, beautiful scenery, beds of blooming flowers, good friends and a happy pooch… what else can one ask for?